PORTLAND, Ore. – Cascade Brewing will release its Figaro 2015 project on June 27 at Noon PDT. It will be available in bottle and draft in house at its two pubs: the Cascade Brewing Barrel House and the Raccoon Lodge, as well as through its distribution channels. The Figaro project is a blend of sour strong blond ales aged in chardonnay barrels for up to 18 months with white figs, lemon peel and orange peel. 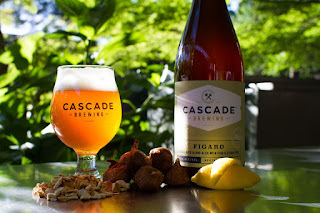 Cascade begins this blend with freshly emptied chardonnay barrels from the Willamette Valley wine region and fills them with its strong blond ale, imparting a complex white wine character to the beer with a hint of oak. After several months of maturation, lemon peel, orange peel and dried white figs are added to each barrel and allow a slow, steady fruit fermentation to take place. Several more rounds of figs are added over a 12 month period, contributing layer upon layer of flavor until the beer has achieved optimum fruit intensity. The fruited beer is then transferred to a stainless steel tank and blended with a small portion of non-fruited sour blond ale until the desired balance of flavors is achieved. The beer comes in at nine percent alcohol by volume. Figaro is a tier one offering; Cascade’s new bottles have distinct label styles for each of the three Cascade Brewing pricing tiers, with each label within the tier utilizing distinctive colors to clearly differentiate each beer. The tiers differ by the style of beer used in the product, the type ingredients contained within, the time aged in the barrels and types of barrels used. The next two scheduled Cascade Brewing releases are Framblanc in July followed by Sang Noir in August. Cascade Brewing has been a pioneer in the sour beer renaissance since 2006 and the proud innovator of the Northwest Sour Ale. Its distinctive sour beer blends feature fruit forward, barrel-aged ales with an emphasis on project year-to-year variation. These beers offer a complex array of flavors derived from the acid, the fruit and the residual flavors present in the barrels in which they age. The resulting beers offer a complex array of flavors and aromas derived from with each project year release capturing the unique subtleties of that year’s growing season. Cascade Brewing’s sour ales are brewed and blended in Portland, Oregon. Cheers to the sours; enjoy in a profoundly wise manner.